DISCLAIMER: Bear with me, I just took Benadryl. 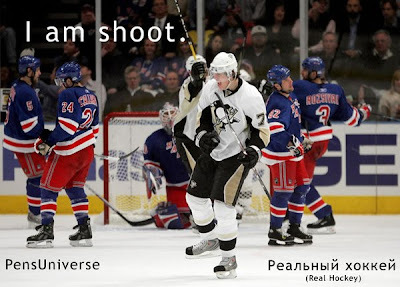 When Jay-Z penned the above song he wasn't talking about the Rangers, he was talking about the Penguins. What does that mean? No clue. Nevertheless, in the last 10 meetings between these teams the Pens have simply owned the battle...nay, won the war. The Pens are 9-0-1 in their last 10 against them. After knocking Jagr and his NY squad from the 2007-2008 playoff run it seems the Rangers just don't know what to do when they see 87 and 71. Incidentally I'm not sure any other team in the NHL has a two player combo with these numbers, would love a stat check on that. Anyway, the game was a bit of a ying yang. By that I mean this: The Pens got better as the game went on and the Rangers, well, got progressively terrible. I'm guessing this is likely all due to the wonderful mode of energy that governs just about every sport, momentum. The Rangers were actually playing a very physical game in the first period despite not having the puck in their possession most of the time. Unloading only 8 shots they were able to get 2 past Fleury, who returns from his Olympic stint. The Pens on the other hand fired off 15 and also put 2 past King Herod, I mean Henry. The second period began the momentum shift. Sure the Rangers went up 4-2 after Flower let another 2 goals by and got plucked from the sidewalk crack, but even at that point no Penguins fan was worried. At least I wasn't (cf. here). I've watched the previous 63 games this year and have written a post game or two titled "...Comback City." Get this, at the 12:39 mark of the second Fleury was pulled and Beej came to the rescue...sort of. What do I mean sort of? He only ended up facing 4 shots the rest of the way. While you might credit the defen-se for this sort of effort, that's simply not the case. The dominating forecheck of the Penguins led to puck possession for nearly the entire 3rd period. After Gogo tied the game at 4-4 Cookie took a penalty. Worrisome Pens fans were delighted to see Jordan Staal single-handedly kill the Rangers powerplay so well it appeared the powerplay was the other way around. Something I found amusing was after Rupp brought the Penguins within one the Rangers announcers already began talking about "getting out of this one with a point." That's how little confidence these MSG announcers had in their own team. If you didn't watch the game you might be wondering why I haven't mentioned SUP87MAN Crosby yet. Well, that was because despite logging 25+ minutes he didn't have the most "effective" game. Of course the true fan will acknowledge the intangibles Sid puts out every game. This is clearly not something I'm going to deny, he most certainly does all the right things. However in my opinion he looks a little tired from the Olympics and could use a game to sit. Gino and Staal on the other hand took the game by storm. This one two punch is at the moment becoming more effective than the Two-Headed Monster. Quite honestly if Bylsma decided to put these two on the 2nd line together with Ponikarovsky I don't think there is another line in the NHL as big that can handle them. All in all this game was just a glimpse into what we can expect over the next month and a half as the Pens round out the season and begin another playoff journey. Do they have some things to work out? Sure they do. But once they hit full stride there's not another team in the NHL who can handle them. We missed Dad who sat out with some back spasms. Must not have gotten off the lazy boy for two weeks. Fleury will be fine. He plays best under pressure and when it counts. Flowers bloom in late April, no? Craig Adams, don't release him. His PK presence as of late is huge. Kennedy and Eaton were the only Penguins not to register a shot. I know this, Mike Rupp will be real important come playoff time. I forgot how much I liked Benadryl.